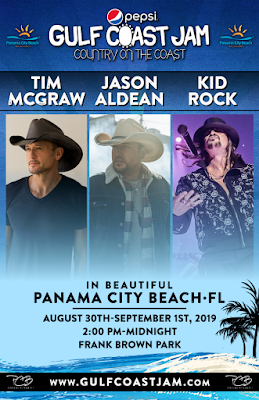 Producers of the Pepsi Gulf Coast Jam have revealed Tim McGraw, Jason Aldean and Kid Rock as the headliners of the 7th annual Country On The Coast festival, scheduled for August 30-September 1, 2019 at Frank Brown Park in beautiful Panama City Beach. The announcement was made concurrently by the massive lifestyle site 30A.com﻿ and www.VisitPanamaCityBeach.com. Tickets for the three-day event, which Billboard Magazine named one of "The 10 Best Country Music Festivals,” will be available beginning April 7, 2019. Pepsi Gulf Coast Jam producers also announced $10 from every paid ticket sold from April 7 until the festival begins Labor Day weekend will be donated to panhandle hurricane relief. Parking passes for the Pepsi Gulf Coast Jam have traditionally been sold on site and always sell out. For the first time, parking passes are being offered online at www.GulfCoastJam.com. In addition, a limited number of Early Entry passes are also available for sale online. Last year’s Pepsi Gulf Coast Jam drew a record 73,000 country fans from all 50 states and 14 foreign countries. General Admission tickets are currently $139. Military tickets are only $129 for all three days. That price will not increase, but quantities are limited. VIP Pit tickets are $429, Golden Circle are $699 and Side Stage tickets are currently $1,150. Skyboxes are sold out. Payment plans are also being offered, and details can be found at www.GulfCoastJam.com. Jammers are encouraged to follow Pepsi Gulf Coast Jam at www.GulfCoastJam.com and on Facebook, Twitter and Instagram for special announcements and exclusive offers.